Weight management formula and herbal fat burner - SHAPE, CLEANSE, NOURISH! THERMOthin® (also know as THERMO Slim UK®) is a comprehensive weight management solution, formulated in line with the latest research in shape technology. The ideal supplement when exercise is just not enough! 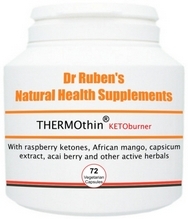 The already powerful THERMOthin combination (with capsicum, L-Tyrosine, guarana, acai berry, green tea and more) has been updated and improved and now also includes raspberry ketones, African mango and cinnamon - three well-documented weight management ingredients that work in harmony with all the other included actives for gentle fat burning actions. This herbal fat metaboliser even includes apple cider vinegar powder - apple cider vinegar is well-known for its role in weight management, as well as digestion support. 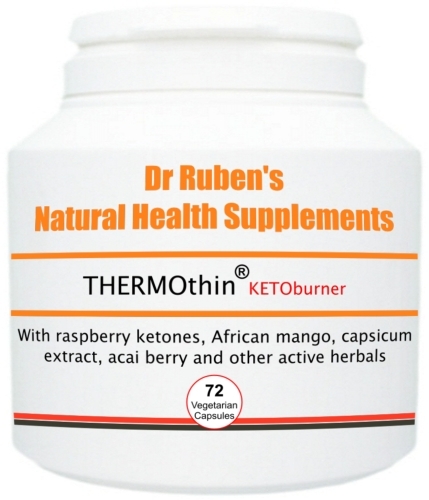 THERMOthin is therefore a comprehensive and effective weight management solution to help you achieve your "get into shape" goals, when used in conjunction with a calorie-controlled diet and exercise regime - the best solution for long term weight loss results! African mango: This type of mango is a rare fruit found in the rainforests of West Africa. It has become a popular ingredient in weight loss and healthy weight management supplements due to the presence of an extract from the fruit called irvingia gabonensis. However, the mangos are also valued for fat and protein rich nuts. Green tea: Camellia thea, or green tea is a rich source of potent polyphenols - active compounds that may have beneficial health properties. Some studies have shown green tea polyphenols to have a stronger antioxidant action than vitamins C and E - two of the most powerful antioxidants. Acai berries: Widely regarded as superfruits, acai berries are rich in antioxidants and other important nutrients, such as potassium, iron , vitamins B, C and E and essential fatty acids . In fact, pure acai berries have 15-20 times the antioxidants (anthocyanins) that red grapes have! They also contain a near-perfect form of protein. Capsicum: Also known as red pepper, chillies, cayenne and Capsicum minimum in Latin, capsicum are bright red dried ripe pods. The powder is known as cayenne pepper. Regarded by professional herbalists as the purest and safest stimulating herb known. Cinnamon: A spice obtained from the inner bark of several trees from the genus Cinnamomum, cinnamon may support a healthy metabolism, stable blood sugar levels and healthy cholesterol levels. L-Tyrosine: An amino acid and a precursor of several important neurotransmitters, including l-dopa, dopamine, norepinephrine, and epinephrine, L-tyrosine is also a precursor to the thyroid hormone, thyroxine (also known as T4). Guarana: A herb that grows in the Brazilian Amazon rainforest, guarana contains significant amounts of guaranine (the active constituent that is virtually identical to caffeine). support energy levels and a healthy metabolism. Citrus Aurantium: Bitter orange contains the amphetamine metabolites N-methyltyramine, octopamine and synephrine - substances which are similar to ephedrine. Raspberry ketones: Raspberries, long recognised as a healthy fruit, have a molecular structure that is similar to the structure of capsaicin, a component of capsicum. Raspberries ketones are natural compounds found in these berries, which may support fat breakdown in the body as part of a calorie-controlled diet. Siberian ginseng: Eleutherococcus senticosus, or Siberian ginseng, has been used for health purposes for hundreds of years in the East, most particularly in China and Russia. Not to be confused with American ginseng (Panax quinquefolius) and Asian ginseng (Panax ginseng), Siberian ginseng contains active compounds called eleutherosides. Kelp: Kelp is a type of large brown seaweed (algae) - a natural food that is very low in cholesterol and is a good source of dietary fibre, riboflavin, vitamin C , vitamin K, pantothenic acid, zinc, copper, folate, calcium, iron, magnesium and manganese. Vitamin B6: An essential vitamin required for blood and haemoglobin formation; calcium and magnesium metabolism; conversion of glycogen to glucose (to be used as energy); energy production; metabolism of foods (protein, carbohydrates and fats); and zinc absorption. Apple cider vinegar: This has been added to support digestion and internal cleansing. Apple cider vinegar has long been recognised as a natural digestive and detox support agent. Piperine: Thought to increase the bioavailability of nutritional compounds, piperine has been included in this formula to help increase the actions and effectiveness of the other ingredients. metabolism, which converts foods we eat into sugars. Chromium may help insulin (a natural hormone that is released in response to eating carbohydrates) to properly "transport" these sugars into cells to be stored as energy. It also supports stable blood sugar levels - crucial for slimmers as high and low spikes can lead to cravings, excessive hunger and binge eating. NEW KETOburner formula with raspberry ketones, African mango and cinnamon PLUS all of the original ingredients! Contains a blend of active nutrients to support weight loss results, digestion and a healthy metabolism, including capsicum, acai berry powder, L-Tyrosine, green tea and guarana!